I love the combination of chocolate and hazelnuts. This combo is often used in cream cheese dips for easy appetizers. 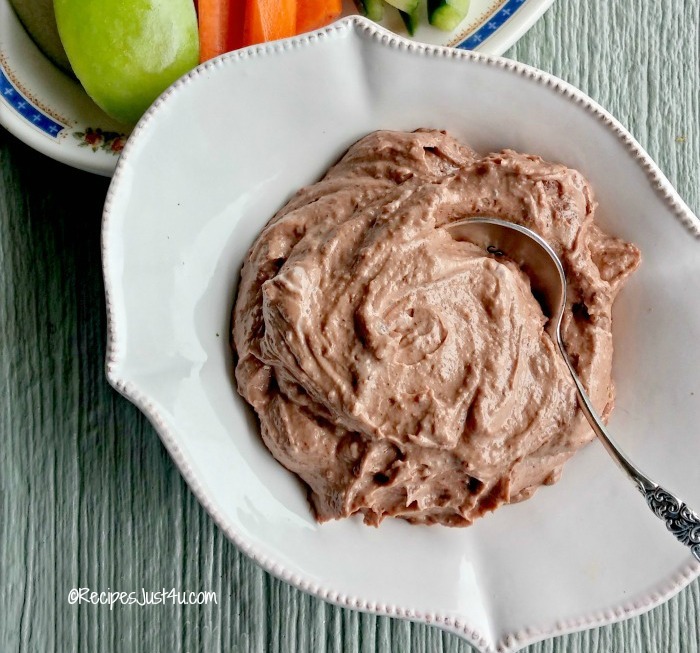 This chocolate hazelnut fruit dip is a healthier version of the traditional flavor but still has tons of flavor and is so easy to make. 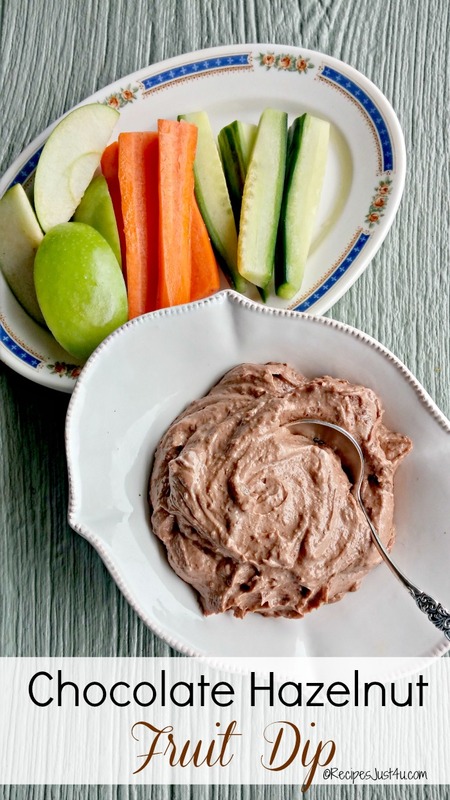 This chocolate hazelnut fruit dip is perfect for fruits and vegetables. My friends at Steve’s Paleo often send me a box of their products to try out in my recipes. I got one just before Christmas and was delighted to find that their Chocolate NutButter was one of the products this month. I LOVE this stuff. It’s a wonderful blend of dark chocolate and hazelnuts that satisfies my Nutella cravings in a flash. And it is perfect for this recipe. 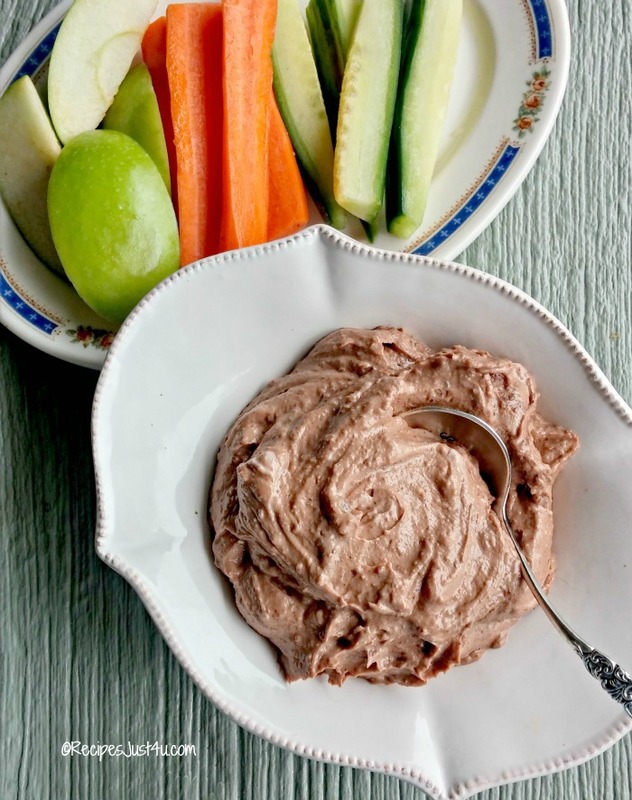 While the end result is not strictly Paleo (the dip contains dairy even though I used a Greek yogurt), it is still a much lighter and healthier version than the normal recipe that calls for sugar, and cream cheese as well as Nutella. For this recipe, I combined the nut better with plain Greek yogurt to make a creamy, tangy and very satisfying dip that has the wonderful taste of both chocolate and hazelnuts. Forego the vanilla wafers and serve it with some sliced veggies or pieces of apple or pear for a no guilt treat that will delight your party guests. The dip could not be easier to make. Two ingredients. Combine. Put in a bowl. Enjoy. How easy is that? And it looks fabulous on a table too. Sliced apples, carrot sticks, cucumbers and celery sticks. Combine the Greek yogurt and nut butter. Mix until smooth. Serve with your favorite sliced fruits and vegetables. This looks so good. A fun snack or dessert dip. Like fondue but chilled! It really is very tasty!